Avi Arad, the man who helped put many comic book heroes on the big screen, including Spider-Man, Blade, and Iron Man, is at it again. This time, he's set his sights on turning video game adaptations into Hollywood blockbusters, just the way comic book movies have become. During a recent interview in Beijing, Arad spoke plainly about his accomplishments and goals. He is working on a few projects that are very dear to his heart: he's got his hand in the Metal Gear Solid, Uncharted, and Mass Effect movies. Arad say's he's looking to create a great stand-out video game movie much like what Sam Raimi's Spider-Man and Blade did for comic book movies. "Converting games to film hasn't been done yet successfully, though Resident Evil did very well—it was actually a great series. I remember when Bernd Eichinger started it," said Arad. "I was working with him, I just couldn't do that at Marvel but I had a good feeling about it, it's a fantastic franchise." Arad says that the problem with video game movies right now is the apprehension of the studios. "I think that film studios are bankers and filmmakers are risk takers and somewhere in between we meet on the battlefield," said Arad. "And the moment one video game movie goes through the roof, it's the same thing that I've been through with comic books." The one video game movie that Arad thinks will push the subject matter forward is the Uncharted movie. According to Arad, there have been some developments on the movie's front. "I think Uncharted will be very successful. It's a father and son game. There are things about it that are interesting. I think the world of antiquities theft, there are many countries in the world that realised they're being robbed and they're trying to recoup these important pieces," said Arad. "Now, the script has a lot of character [and] I think that has a shot at being the first one [to succeed]." Of course, making the Uncharted movie isn't exactly going to be a cakewalk. Arad says that because games have a longer time to engage the audience than, say, a 2-hour movie, video game movies need more work. To Arad, even if a game is selling well, it doesn't mean that it will be a great movie franchise. It needs a great story, and Arad thinks the Metal Gear Solid movie will also deliver due to its story. "If you go to Metal Gear Solid, it's actually full of storytelling," said Arad. He says that, as a storyteller, he's always looking to operas or The Bible. "And with Metal Gear," he says, "you have Cain and Abel." During the interview, Arad said he would be having dinner with Kojima soon. He told me the movie is still in its very early stages and he expects it to be about three years or more away, explaining that negotiations between studios and companies take a lot of time. 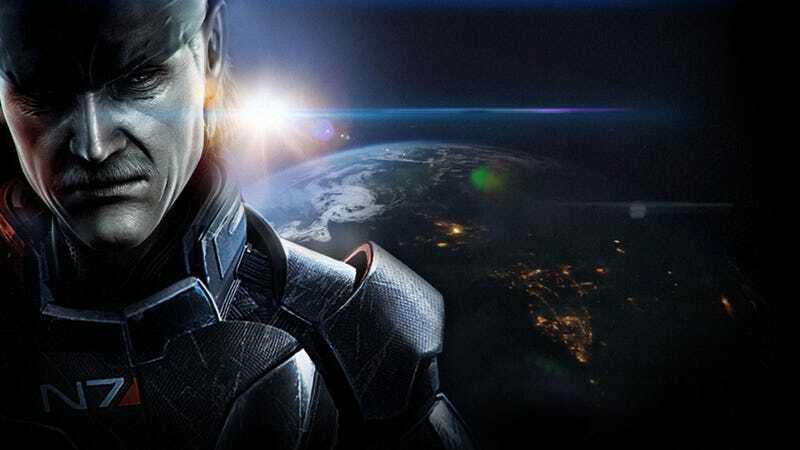 Speaking of time, while the Metal Gear movie might be three or more years away, the Mass Effect could take even longer. According to Arad, the Mass Effect movie might be about five to six years down the line. "It's a big idea, that we, humans, are the least developed, the least trusted, it's an interesting mirror image of our world, we are the aliens now," said Arad. "Love the project, it's getting there, it's been a lot of work; some movies take five, six years before they're ready." On top of video game movies, Arad is also working with the smaller screen. The Arad produced Pac-Man and the Ghostly Adventures is currently the number 1 show for its target demographic on Disney XD. In Pac-Man and the Ghostly Adventures, Pac-Man and his world is given a more fleshed out story. I haven't watched it so I can't make too many judgements, but some of the ideas Arad shared with me were really cool. "Pac-Man, he's a person now and he has issues and things he likes and the netherworld is where all the ghosts are. There was a reason why there are ghosts, because two brothers were fighting for control of Pac Land," said Arad. "One of them is the tough guy heading the land of the ghouls and all they want to do is take over the world." As an added bonus, Arad also revealed to me that he's been pitched a Naruto movie. Note: I interviewed Mr. Avi Arad last Friday while he was in Beijing for my day job at the China Daily. Representing the China Daily, I talked with Arad about his goals and plans for China as well as some other projects he is currently working on. The above are extraneous quotes unused in my original article published in the China Daily on Thursday. Top image courtesy of SolidSnake56 @ Tumblr/deviantART/Twitter.